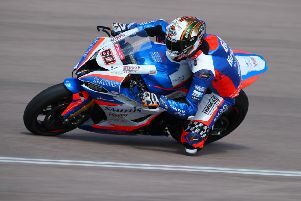 Willoughby rider Peter Hickman moved into the British Superbikes top-10 after recording two good results in round six at Brands Hatch. A solid qualifying session gave Hickman a fourth row start to the first of the two 20-lap races, and he got away well to slot into eighth position. He dropped a couple of places to 10th but at the half way stage of the race had clawed his way back up into eighth position. One lap later he passed Richard Cooper and was promoted up to sixth place when Tarran Mackenzie crashed out of third place. Hickman maintained his position to cross the finish line in sixth place to pick up 10 championship points. As the second race got underway Hickman made another good start, but he was pushed wide at Druids and found himself down in 15th place at the end of the first lap. With plenty of work to do, he set about his task diligently and, with some good overtaking manoeuvres in the closing stages, he was rewarded with 1oth place for his second top-10 finish of the day. Hickman said: “Qualifying continues to be my Achilles heel but I’m satisfied with two top-10 finishes today, particularly the sixth place in race one. With the points accrued from Brands Hatch Hickman moves up into 10th place in the rider standings on 68 points. Following the Suzuka eight-hour race on Saturday, Hickman will head to Thruxton for the next round of the British Superbike championship. He usually goes very well at Thruxton and will be anticipating two good results to boost his points tally and move him further up the standings.